Tonight at 1am Eastern / Midnight Central / 11pm Mountain / 10pm Pacific the second round of the 2015-2016 Formula E Championship will take place in Putrajaya, Malaysia, a scant 30km from the Sepang International Formula One Circuit. So what should you know about tonight’s race? The Putrajaya Street Circuit returns with no changes from last year, giving a variety of corners and straight lengths for the drivers to navigate. Notible overtaking areas include Turn 3 and Turn 7, both located at the end of decent-length straightaways, and the Turn 10 hairpin giving drivers an opportuity to catch out other drivers and sneak by on the inside. The winning driver will need to keep maximum speed on the front straights, be tidy through the hairpin, and flow through the many different radii corners without tagging the barriers. The main chassis of the cars remain the same as last year, as does the aerodynamics and front suspension. But the biggest changes are with the rear half of the cars; Teams are free to develop their own motors, gearboxes, power controls, and rear suspensions. The official Formula E website has a great breakdown of each team’s power systems, this year 8 of the 10 teams are running their own power systems (only Aguri and Andretti are using last year’s powertrain) with different ideas on how many gears to run, from NEXTEV TCR’s single-speed transmission to Mahindra Racing’s 4-speed gearbox. At the moment Renault eDams’ two-speed gearbox appears on top, but with 10 more rounds of race it’s still to be seen which design comes out on top. Several teams were involved in a game of Musical Chairs for the new season. 1997 World Driver’s Champion Jacques Villeneuve joined Formula E driving for the Ventur team, taking the seat previously occupied by Nick Heidfeld, who moved over to the Mahindra team taking the seat previously occupied by Karun Chandhok. Simona de Silvestro took the seat at Andretti previously filled by Jean Eric-Verne, who moved to Virgin taking the seat previously occupied my Jaime Alguersuari, who left motorsports entirely. Former GP2 competitor Nathanael Berton took a seat at Aguri previously occupied by Salvador Duran, who moved over to Team Trulli and took a seat from Jarno Trulli; However, after the non-start at Beijing, Duran left the team which put Jarno Trulli back in the driver’s seat. With a mix of new blood and experienced drivers it’s to be seen who can make the most of the remaining ten rounds to come out on top. The opening round in Beijing opened with a bang. Sebastien Buemi came into Beijing with a chip on his shoulder, having lost the 2014-2015 championship in the final weekend in London. He firmly stamped his authority by winning with an eleven-second margin over second-place Lucas di Grassi; Nick Heidfeld rounded out the podium. Defending champion Nelson Piquet Jr could only muster up a 15th place finish after starting 18th and last after technical issues limited on-track time in practice and gave a slow qualifying time. Nicolas Prost, famous for a last-lap crash with Nick Heidfeld in last year’s Beijing race, retired with a rear wing failure and finished 16th. With new powertrains, some new drivers, and a lot of racing ahead, the only thing left is to see how the racing goes. 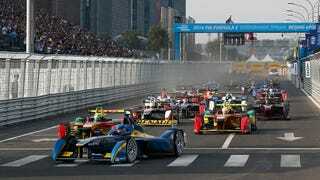 So tune in tonight, Putrajaya is the start of the final ten races of the 2014-2015 Formula E Championship.